Early 1990, somewhere on a German landfill: mountains of waste were growing ever taller. There was barely any space left. In political circles, the blame for the looming landfill crisis was chiefly attached to the increasing amount of plastic packaging. To prevent total collapse, the dual system of waste collection was established, along with the Green Dot. This year marks its 25th anniversary. The logo has been printed millions of times and can be seen on milk cartons, candy wrappers and cans. It is widely recognized in Germany, with most knowing the Green Dot either well, or very well. Many find it helpful: it is not only good for the environment, but it also acts as a sort of compass, helping Germans navigate their way through the recycling jungle. Yet it seems all is not perfect when it comes to waste management, even 25 years after the logo was introduced. A quarter of a century ago after then-Federal Environment Minister Klaus Töpfer introduced the dual system of waste collection and the Green Dot to Germany, nearly 90% of people recognize the small circular logo which appears on packaging made of plastic, metal and composite materials. Recognition is high, regardless of gender or background. 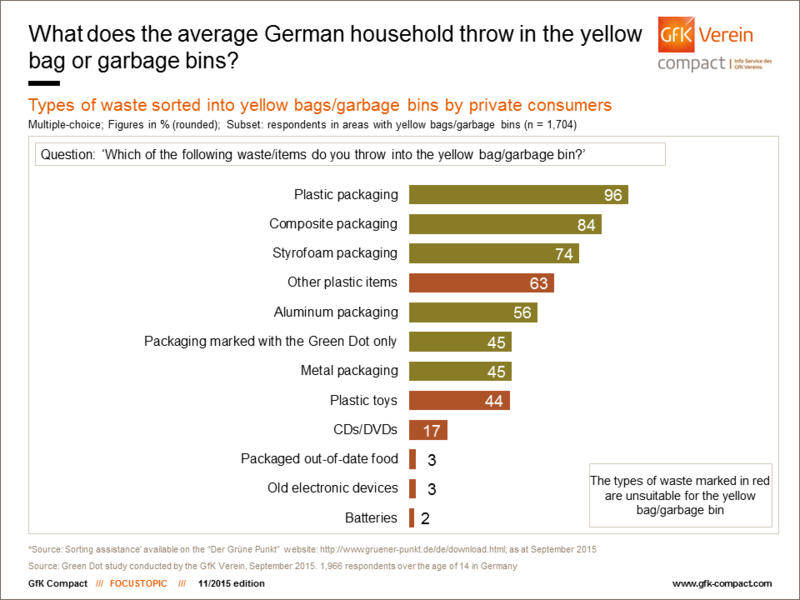 This is shown in the results of a study conducted by the GfK Verein, in the course of which 2,000 Germans were asked about their attitude towards the Green Dot and the system of yellow bags and garbage bins, as well as their habits when it comes to separating trash. The Green Dot is especially rooted in the minds of those aged 50 to 64. This is not surprising, given that it was launched and promoted at around the time that they were starting out in working life and moving into their first own home – which probably came with separate bins for plastic, food waste and “everything else”. Of this generation, 93% said they were familiar or very familiar with the symbol, while 5% said they had seen it at least once, even if they did not know what it means. 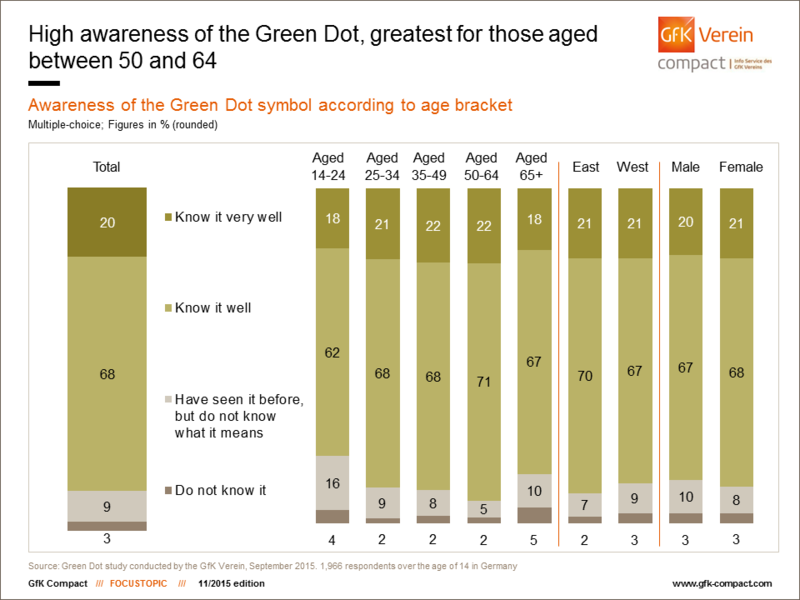 In the youngest age bracket, this is considerably more common: 16% do not know what the Green Dot means, while 4% have never even seen it. What do Germans think the symbol means? It appears on packaging for which the costs of disposal and recycling are met by the manufacturer. This is achieved via a payment to Der Grüne Punkt – Duales System Deutschland GmbH, a company which collects and recycles packaging waste and/or commissions disposal companies to do so on their behalf. This is intended to help avoid the situation seen in the early 1990s when mountains of trash were forming, and as a result, to reduce the environmental impact. Just short of three quarters of respondents shared in this thinking and believe that the Green Dot supports environmental protection. In this respect, there is little variation between different ages, backgrounds or genders. One criticism of the dual system has always been the confusing recycling rules. Can everything with a Green Dot be put in the yellow garbage bin or bag? Where do I put broken plastic toys? What exactly can I still put in with general waste? Germans feel they have now mastered the art of sorting trash, with the majority claiming that they would still understand the recycling rules without the Green Dot. Two thirds claim to know what belongs in each container: among the 25 to 34 age group, this figure is even higher, at 75%. 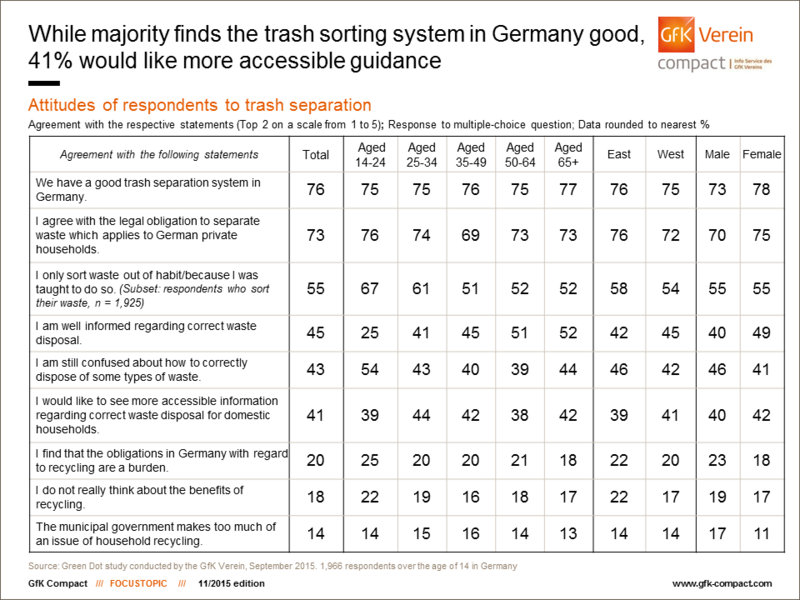 Those living in the former East Germany are more sure of their trash-sorting abilities than their counterparts in the West (72% vs. 66%), as were females when compared with male respondents, at 71% and 64% respectively. A Green Dot on packaging does not automatically mean that it will be recycled. In its German Packaging Ordinance, the Federal Environment Agency (Bundesumweltamt) sets recycling quotas for paper, glass, tin, aluminum, plastic and composite packaging. These are 36% for plastic, 60% for aluminum and composite materials, 70% for tin and paper and 75% for glass. Even though these quotas are surpassed, consumers are largely unaware that not all waste is recycled and that the burning of some waste for the purpose of energy generation is also permitted. 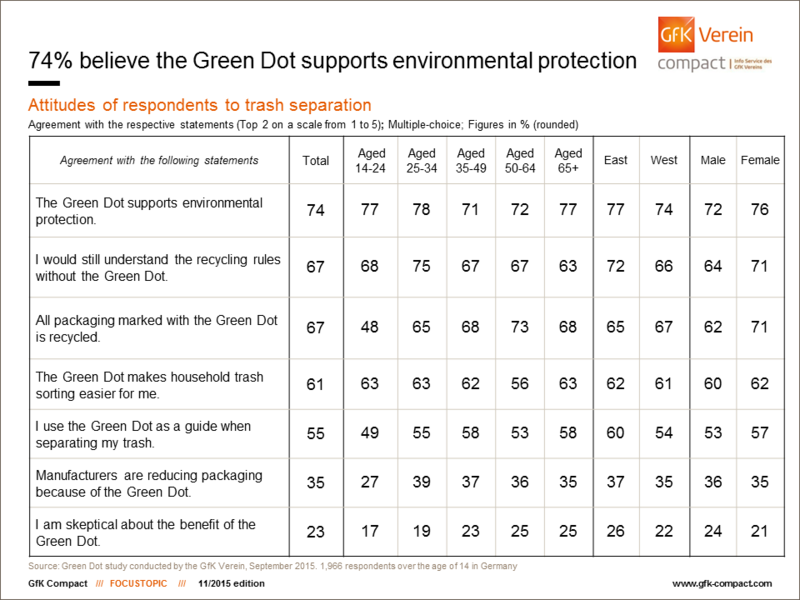 Of all respondents, 67% assume that all packaging marked with the Green Dot is recycled. For 61%, the symbol is primarily seen as a means of making waste separation easier, while 55% of those surveyed use the interconnecting arrows as a guide for how to dispose of their trash. Only a minority believe that the Green Dot has fulfilled its purpose, namely reducing the overall amount of packaging. Just 35% of respondents believe that manufacturers have been prompted to reduce packaging. And almost one in four is skeptical about the benefits of the symbol. The Green Dot and yellow bag or garbage bin were introduced together, and are viewed in a similar positive light by Germans. Although some municipalities have switched to using recycling bins, most households still have yellow bags or a yellow garbage bin which they feel plays an essential role: 87% of respondents see the yellow bag/garbage bin system as important for protecting the environment. Almost as many (85%) regard it as key for effective recycling. As well as environmental protection, practical considerations come into play. 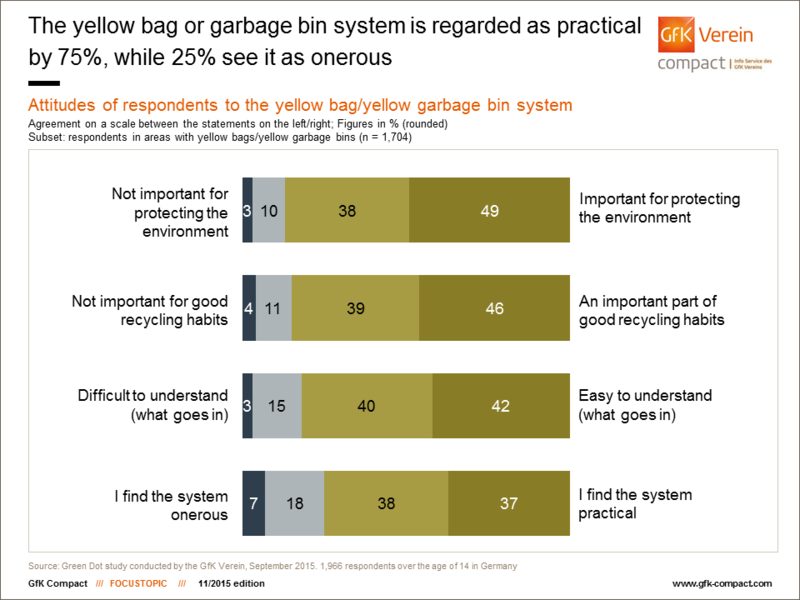 Of those surveyed, 82% do not find it difficult to understand what they should put in the yellow bag or garbage bin, and 75% describe the system as practical. However, at least 25% of respondents find the system arduous. Age, gender and location are all factors in how confident Germans are in their waste sorting capabilities. For example, 41% of respondents aged 50 to 64 said they were “very sure” whether plastic coat hangers and juice cartons belong in the yellow bag. Those aged under 24 find this the most challenging, with only one in five feeling they know exactly how to correctly dispose of their trash. On a regional level, 36% of West Germans would call themselves an “expert” in this regard, slightly ahead of East Germans (32%). 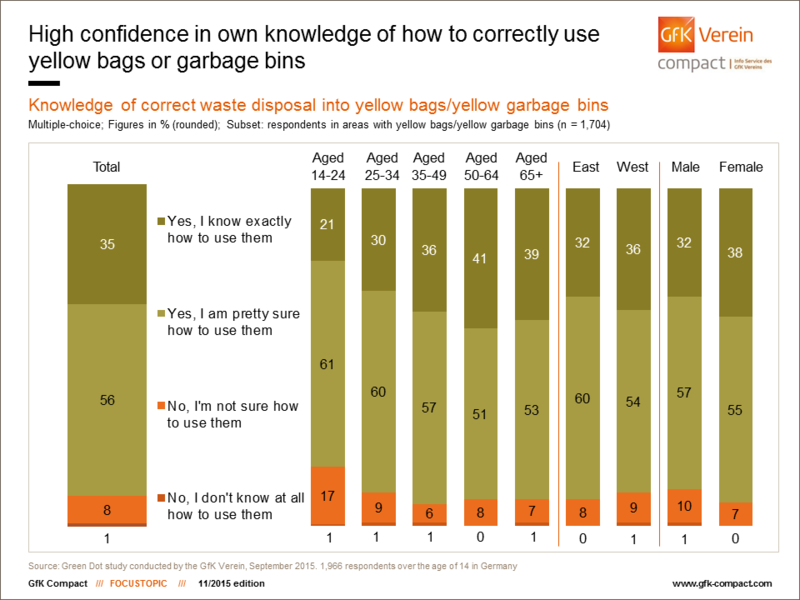 More women (38%) state that they know exactly what can go in the yellow bag/garbage bin than men. However, there is a difference between Germans’ perceptions of their abilities and the reality. While they are indeed seen as avid recyclers who neatly separate their trash and use the colorful bins, some waste still ends up in the wrong one. As many as 63% of respondents put plastic that is not packaging in the yellow bags or bin, while 44% include old or broken plastic toys and 17% think this is the right place to dispose of CDs and DVDs. Less often, consumers throw in out-of-date food in its original packaging and old electronic devices (both 3%) as well as batteries (2%). However, it was clear to respondents that the yellow bags and garbage bins are intended for plastic, composite, metal and Styrofoam packaging. Most people dispose of these types of waste correctly. Overall, 56% put aluminum packaging into the container and 45% throw in metal packaging such as metal cans. Equally as many consumers only use the yellow bags or garbage bin for items marked with the Green Dot. It is clear that the German recycling system is in fact quite complex. But Germans are, on the whole, satisfied. Three out of four rate it as good, and almost as many agree with the legal obligation to sort trash. Many people recycle out of conviction, but habit also comes into play. Some 55% of respondents stated that they sort their trash because that is what they were taught. This is especially the case among the youngest respondents. The under-25 age bracket is also the least interested in information pertaining to recycling: while 45% of those surveyed said they were well informed about the subject, this figure was only 25% among the youngest respondents. Accordingly, they are more likely to be unsure of the correct recycling rules: more than half of young adults sometimes have difficulties when it comes to recycling. For the population as a whole, this figure is only 43%. To fill the gaps in their knowledge, 41% of respondents called for more easily accessible information pertaining to the subject. Critical voices are heard less often, with only one in five of those surveyed regarding the recycling rules as a burden. Again, more of the youngest respondents stated this (25%) than the overall average. The percentage of Germans who do not pay consideration to the benefits of recycling is 18%, while 14% believe that municipal governments make too much of an issue of household recycling. The obligation for the relevant manufacturers to print the Green Dot on packaging ended in 2009, resulting in the symbol being less common on supermarket shelves. Despite this, awareness among Germans is still very high. This is particularly true of the generation which grew up in the era of the Green Dot. However, consumers still don’t find it overly easy, even 25 years later, to work out what goes in the yellow bag/garbage bin and what does not. To be honest, who’d have known that you can put cotton bags in there too? If you’re in Germany and puzzled by the different-colored bins, but don’t want to read long, complicated legislation, then the recycling guide on Der Grüne Punkt’s website may come in handy. For younger generations, the Recycling Master app might be of more use – a game which requires skill and a particularly good knowledge of recycling. If “Der Grüne Punkt” intends to continue to be a useful guide in the future, a little more work educating the uninitiated probably wouldn’t do any harm. If you have any queries concerning GfK Compact, please contact Claudia Gaspar (claudia.gaspar@gfk-verein.org) or Claudia Castaldi (claudia.castaldi@gfk-verein.org).